Jamie Norman, 5, starts her schoolwork as she and her classmates at Enrico Fermi School No. 17 finish eating their breakfast, Thursday, Oct. 3, in Rochester, N.Y.
Before the day’s assignments begin, kindergarteners at Enrico Fermi School No. 17 in Rochester, N.Y., know there’s one ritual that always comes first: eating together. 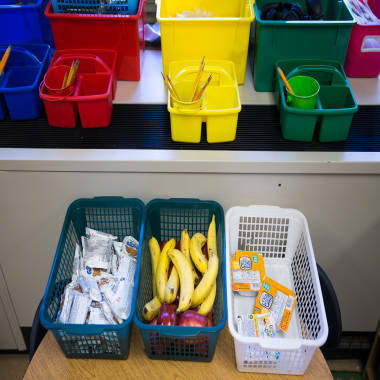 Their teacher, Marie Rice, has already placed each child’s breakfast of apples, cereal, milk and cheese sticks on their desk. Before digging in, Ja’Cariya Clayton, 5, helps two less dexterous 4-year-old boys open their food packaging. Similar class time meal programs have been adopted in several states including Arkansas, West Virginia, Vermont and Colorado, where ‘Breakfast After the Bell,’ requires hundreds of schools to make breakfast available in the classroom, after first period or as a grab-and-go cart. In the past, getting children to eat breakfast at school hasn’t been easy -- even in districts where needy kids go hungry on a daily basis. Children who qualify for free meals often feel stigmatized when they’re the only ones in the food line who don’t pay, and arriving at school early to eat breakfast in the cafeteria isn’t always possible if parents are rushing to work, or if the school bus runs late. Soon, said Principal Ralph Spezio, School No. 17 will transition into serving hot breakfast, such as waffles, eggs and breakfast pizza. For students who are still hungry throughout the day, extra food is stored in these bins at Enrico Fermi School No. 17. Between 750-1,000 students in the Rochester, N.Y., school district live in shelters. Breakfast in the classroom is bound to become even more prevalent next year when a new government program goes nationwide. 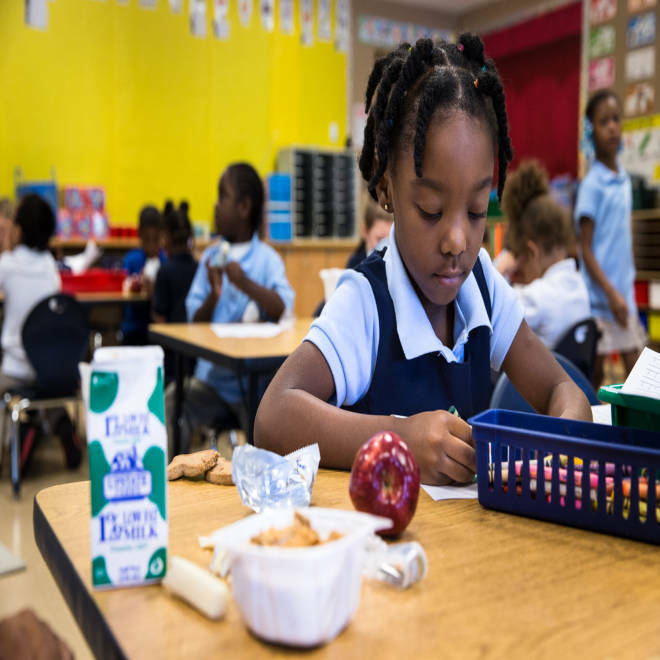 The so-called Community Eligibility Option provides federal funding to school districts in poverty-stricken communities that give all students free breakfast and lunch, regardless of income level. With the new program, as long as 40 percent or more of students at a school receive food stamps, or other specific types of federal assistance, any child can receive two free meals a day without the need for applications or income-based tracking. Ten states and the District of Columbia are currently participating, but every state will be eligible in the 2014-2015 school year. In Michigan, where the program was phased in during the 2011-12 school year, educators are marveling at its impact. When school begins, two students are assigned to go to the cafeteria and bring breakfast back to the room. Two others pour milk, making sure everyone has just the right amount. “It helps them feel like they have a sense of belonging,” Tillmon said. One day, she said, a kindergartner known for her perfect attendance came in late, missed breakfast, and was acting up in class. Tillmon took the child aside to find out what was wrong, and the girl began to cry. Finally she admitted she was hungry – because the last time she ate was at school, the day prior. “She had a relationship with me, so she could tell me she hadn’t eaten since yesterday,” said Tillmon, who quickly sent her student to the lunchroom to get some food. At Brewer Elementary-Middle School, the breakfast program has improved attendance, and had a “phenomenal” impact on tardiness, according to Principal Cecily Wilson, who said she’s seen a 40 percent decrease in students arriving late to school. Next year, Wilson says, the middle school kids will eat breakfast in class, too. A few years ago, only 28 percent of kids in West Virginia ate breakfast at school. “We looked at our breakfast participation and it was horrible -- we weren’t even feeding our needy kids,” said Richard Goff, the executive director of the state’s Office of Child Nutrition. When West Virginia implemented Community Eligibility last year alongside their own strategies, they saw breakfast participation go “through the roof,” Goff said. The state also brought in approximately $4 million in additional federal revenue as a result. In Mason County, W.V., where about half the population is needy, more than 90 percent of kids ate breakfast at school during the 2012-13 school year. Mason County food service director Cristi Rulen, who has been on the job for 28 years, said it has improved student discipline, and helps kids pay better attention in class. Brett Carlsen contributed to this report.